Suffering from relationship woes, but too embarrassed to confide in a friend? 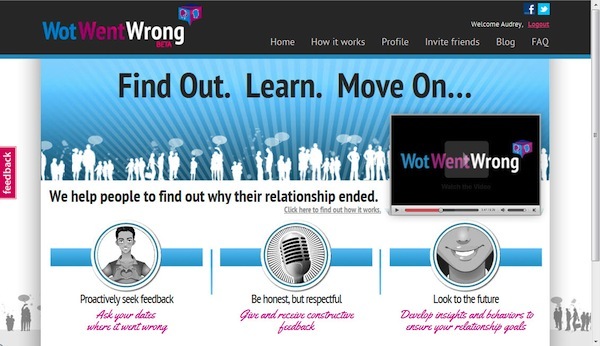 Well, there’s an online site that you can potentially find some solace in: WotWentWrong is a relationship website that helps you connect with other people going through similar experiences, and even help “passively dumped” people get explanations – excuses? – from the exes. WotWentWrong also recently launched “Impressions”,a social timeline for people to anonymously seek crowdsourced dating and relationship advice, record their relationship milestones, and follow other people’s relationships. Founded and bootstrapped by Australian entrepreneur Audrey Melnik with money saved from her IT consulting practice, WotWentWrong brings the interactivity (and anonymity) we all expect from the social web into the relationship space – without the ramifications of oversharing potentially embarrassing and harmful information over personal social networks or in real life. Melnik plans to add real-time professional advice from counselors and psychologists as the site’s revenue stream.